It’s the night of the Hat Director plays, and we’re honored to bring you TWO blog posts today featuring playwrights Riti Sachdeva and Kevin R. Free. Both of these plays are two of SEVEN inspired by the prompt “To Serve and Protect” that you can see tonight at The Wild Project at 7:30pm! The bar will be open, tickets are suggested donation (online or at the door) and we are almost sold out so we encourage you to RSVP! Q. In writing for the Directors Salon, how did you interpret the prompt “To Serve and Protect” and how did it inspire “Brooklyn Bound”? A. I thought first, of course, of police since that phrase is most often associated with their job. Then I thought of the military. The state is supposed to serve and protect its citizens even though many of us don’t experience such a simple relationship with authority. I ended up going to a play I had been working on that explores racial and gender tensions and being caught in terms of loyalties – who is each character, in this moment, compelled to serve and protect? A. Mostly I balk at the phrase because of it’s association with policing. It has an ironic twist in my mind though my BROOKLYN BOUND is not about that irony. I’ve been thinking more of it as a personal responsibility thing since I was introduced to the prompt. A. I’m still learning what these key elements are. For me, there needs to be an understanding of the political/social/economic points of entry into the play from the director. I also enjoy working with a director who loves to work with the actor’s body. I learn a lot from a director who challenges me with difficult questions but also “serves and protects” the play as a piece that is working and still needs fine tuning. Also a successful collaboration depends on the director and playwright working towards both a similar aesthetic vision and message. A. My experience has been that directors see or read a work of mine and read more and meet with me and share some vision of how they see the play working as a production. When a director takes this kind of initiative and interest, I feel like it’s laying a groundwork for future collaboration: I can include this director in grant or workshop proposals; have informal readings of a play with this director at the helm. I’m eager to meet more directors who have an interest in my body of work so we can take advantage of “small” opportunities that may become larger. I also want to see the work of different directors – see what work they’re attracted to and how they manifest their vision. It’s one of the most exciting aspects of being an emerging playwright is connecting with emerging directors. A. Working on a play as part of the Women’s Project Lab in my continuing exploration of tensions between South Asians and Blacks in the U.S. – partly as a personal response to the Black Lives Matter movement. Working to adapt my play Other Farmers’ Fields to kathakali dance theatre form which is indigenous to Kerala, India. Also on my way to Belize for a three week residency with OmniRootz Live Artz. Riti Sachdeva’s short play “Brooklyn Bound” will be performed on Sunday, March 22nd at 7:30pm at The Wild Project and will feature Farah Bala, Rajesh Bose, and Brian D. Coats. For more information, visit our Facebook event. Tickets are suggested donation online or at the door – click here to RSVP! 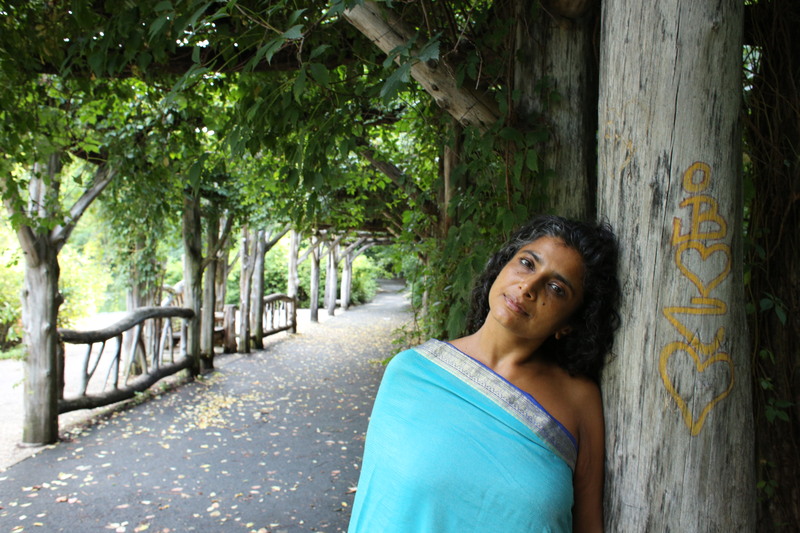 Riti Sachdeva is a theatre maker, dancer, and cultural worker. Her work has been developed by the Women’s Project Theatre Lab, the Public Theater, The Civilians R&D Group, The PlayWrights Center, National New Play Network, and Manhattan Theatre Works (MT Works.) Her play Parts of Parts & Stitches won the Kennedy Center ACTF Quest for Peace award and received its world premier in NYC produced by MT Works. Sachdeva’s acting highlights include work with Disney Channel, HBO, MT Works, and midNites cHiLd in NYC, LA, Toronto, Albuquerque, and Santa Fe. This entry was tagged #year5, Directors Salon, emerging directors, playwrights, Q&A, riti sachdeva, the 5th anniversary working theater directors salon. Bookmark the permalink.